Rejuvenated Christmas trees, parking fees and a 'donutting' groom all make the headlines in the local papers. 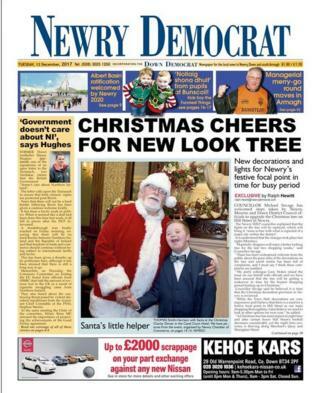 The Newry Democrat is celebrating after Newry, Mourne and Down District Council (NMDDC) decided to redecorate one of the city's Christmas trees. The council's first attempt decorating the tree on Hill Street was not a hit with the locals. Judging by the picture in the paper they had due cause for concern - it was a sorry-looking specimen. The Democrat also brings us the "tree-mendous" news that Bessbrook is to get a new tree in time for Christmas - after vandals struck twice at their first one. First, they pulled the lights from it, leaving Santa, having flown in from the North Pole presumably, with only a few lights left to turn on. 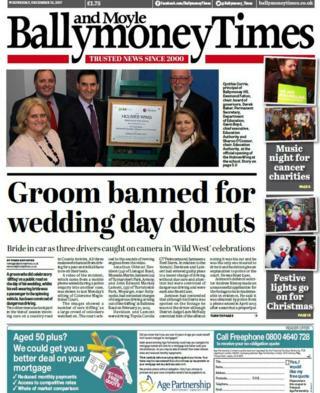 "Groom banned for wedding day donuts," is perhaps a headline that would not be understood by everyone. The groom of course has lost his licence over a driving offence, not for eating too many pieces of fried circular dough. The bride, wearing her wedding veil, was in the passenger seat as their coming together was celebrated on the Ballinlea Road near Ballycastle in 2015. Footage of the incident was discovered by police on a mobile phone during an investigation into another case, reports the Ballymoney and Moyle Times. Two others who took part in the 'diffing' in separate cars also lost their licences. Despite mitigating arguments, the judge said he had no choice but to convict all three of dangerous driving and banned them from driving for a year but granted them permission to drive in the meantime in the event that they decided to appeal. One defence lawyer described the celebrations as being "akin to firing pistols in the air in the Wild West". The devastation caused to the north-west is the subject of the lead story in this week's Londonderry Sentinel. 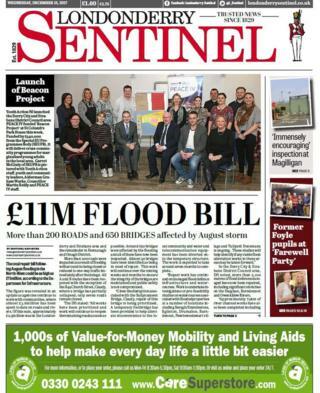 The paper reports that the bill for the flood could rise as high as £11m, with 200 roads and 650 bridges affected. Coverage is given to the repair work carried out so far as well as to the efforts being made to limit the damage of future flooding. The Sentinel is also looking back to the Tullyally bomb attacks 30 years ago, with one person describing it as a "forgotten atrocity". One person died and dozens were injured when two bombs detonated in the mainly Protestant estate in December 1987 - a third device was made safe. The RUC blamed the IRA for the attack. 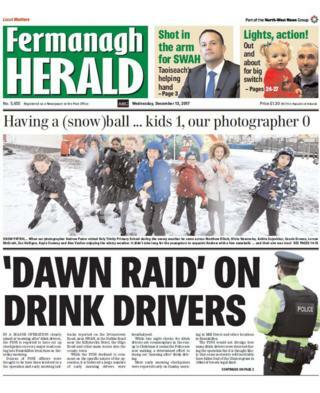 A major police operation aimed at "morning after drivers" was set up along major routes into Enniskillen last Saturday morning according to the Fermanagh Herald. The operation created long tailbacks for commuters, with large numbers of drivers reportedly breathalysed. The PSNI did not reveal how many drivers it stopped or tested, but it is understood that some drivers failed the test. Legislation introduced this year gives police officers more power to stop motorists and form checkpoints to test drivers. The Mid-Ulster Mail reports that the council has rejected claims it deliberately didn't advertise public meetings as part of the consultation on its future parking strategy. The group - Campaign Against Car Park Charges (CACPC)- said the meetings were only advertised on the council website. A spokesperson for the council denied the claims and said magazines containing the details had been delivered to 55,000 homes in November. CACPC has said about 3,500 have signed a petition against plans to introduce parking fees. A consultation on parking in the area began in October and is due to run until the end of December.